The tools of social media may be, for the most part, free – but there’s a cost attached all the same. The time it takes to manage social media has been a roadblock for many nonprofits. But social media is no longer optional, and nonprofits need to figure out how to use these new communication channels efficiently and effectively. What works – and what doesn't? 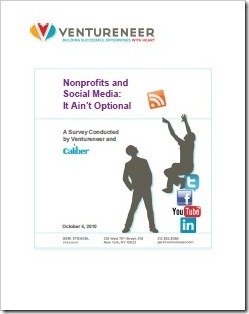 Ventureneer and Caliber surveyed 891 nonprofits in August 2010, to gather data from which to develop “best practices” for social media marketing. The results of this survey, detailed in the 44-page Nonprofits and Social Media: It Ain't Optional (PDF), will be useful to nonprofits both large and small – whether your organization is new to social media or you’re looking for ways to make your social media use more efficient and effective. For example, the report identifies 10 habits of successful users of social media that contribute directly to their effectiveness. 1. Excel at social media by dedicating the time to it. That may not sound like 25 hours a week but providing the content for tweets, Facebook, and blogs requires research and writing, both of which take time. 2. Use social media for more purposes. 3. Start slowly, build a foundation, and then add more media (and time) to the mix. ...The longer nonprofits use social media, the more kinds of media they use. The more kinds they use, the more successful their social media efforts are. 4. Rely on social media to strengthen marketing, not reduce marketing expenditures. 5. Dedicate a larger share of the marketing pie to social media. ...Include social media campaigns in the budget allocations for fundraising, cause marketing, and advocacy efforts. Social media should be viewed as part of these efforts, not as a separate marketing function. 6. Maximize other marketing with social media. There is a powerful synergy between social media and other marketing efforts, especially other e-marketing efforts, such as search engine optimization and email. When social media is integrated into efforts to drive traffic to websites and increase search engine rankings, it not only increases the quantity but the quality of traffic. 7. Allow people to learn in the way that works best for them. Different people learn differently. Nonprofits need to choose the learning method that works best for the staff assigned to implement the social media program. ... However, if the nonprofit wants to become very successful, it must train its staff. 8. Go with your strengths; outsource your weaknesses. The more nonprofits use social media, the more they understand that some tasks are better done by outsiders. It’s better to specialize and outsource what you don't do well to a firm or a freelancer who does know how to do it.... Obviously, budget will need to be weighed in this decision, but don't forget to weigh effectiveness as well. 9. View social media as cross-functional. Nonprofits that do not recognize the benefits of social media throughout the organization may function less efficiently and effectively than those that do. Nonprofits must break down the vertical organizational chart. In order for social media to work best, everyone in the organization must work together to maximize resources. In fact, social media may be the catalyst for a more collaborative culture. 10. Balance empowerment with accountability through policies and guidelines. ... An employee code of conduct sets guidelines for employees about their personal use of social media. An operations manual provides the policies and procedures for those involved with social media on behalf of the nonprofit. Both are necessary to protect your organization and leverage resources. Ventureneer has released its survey report under a Creative Commons Attribution 3.0 US license. That means you’re free to copy, distribute, transmit and/or adapt Nonprofits and Social Media: It Ain't Optional (PDF) as long as the source is given proper attribution. Share it with your colleagues! To augment the report, Ventureneer has also created a web page to serve as a one-stop, central resource about non-profit use of social media. You’ll find more non-profit case studies, how to tips, research, online classes (including a wealth of archived webinars you can watch online, on your own time), and best practices for using key social media tools at http://ventureneer.com/NPSoMe. Useful, useful, foundational stuff. Thanks, as always, Rebecca! I HATE tweets that have been twittered to let everyone know that you are there. Twitter is like communication: don't, if you have got nothing to say! Excellent article, I believe that twitter can play a crucial role in building a company's PR strategy, especially nowadays when social networking is at its peak. Great tips on using social media. Are there metrics relevant to non-profit start-ups? I am not much impressive about twitter. Face book is better than this. Traditional events are always good for an association. Each quality event will create more reputation for any association.